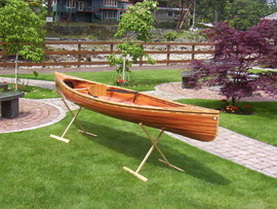 The ever popular Cedar Strip Boat Building class offered by the Pender Harbour Living Heritage Society and taught by Rick Crook, emphasizes the utility and versatility of this technique. Using cedar strips, epoxy and fibreglass cloth, students construct a "Wee Lassie" solo canoe over one full day and six evenings. The class boat then becomes available for purchase by one lucky class member for the cost of the materials. We acknowledge the financial support of the B.C. Government for this course. Six hours of instruction the first day and then six evenings. Students will try all the steps to build a cedar strip boat while building a Wee Lassie solo canoe. This construction method can be used to make light, easily maintained and beautiful wooden canoes, kayaks, rowboats or sailboats. Once completed, the boat can be purchased by a student or will be auctioned off. Participants learn all the steps in this boatbuilding method and are able to take this knowledge home to begin work on the boat of their dreams. Dates: April 7 (Sunday) - six hours; then six Wednesday evenings, April 10 through May 15. Location: Sarah Wray Heritage Hall (Irvines Landing School), corner of Hotel Lake Rd. and Irvines Landing Rd., Garden Bay. Contact: Elaine Park at (604) 883-0744 for further information or to register.